The New York Times surveyed their staffers in December, asking them questions about the quality of management and other worklife experiences. About half of the Times’ newsroom and other employees participated. 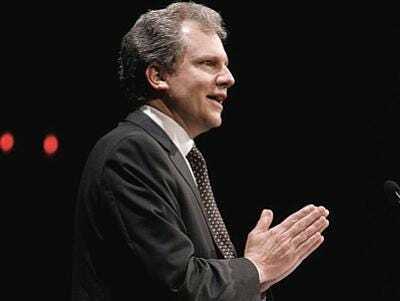 Today, a memo from publisher Arthur Sulzberger Jr. and president and chief executive Janet Robinson was sent out to staffers reviewing the results. Career growth. Employees are looking to the Company to foster ways to help them grow professionally. Meritocracy. Employees feel that policies and practices should be administered in an even-handed way. Agility. Employees want the Company to make opportunities to learn new things more available, and to further encourage adaptability and change. Innovation. Employees want to try new and novel approaches in their day-to-day tasks. But working for the Times isn’t all bad, of course. Their reportedly happy with work/life balance at the Times. We heard it was free “back rub” day earlier this week. Not too shabby! It is critically important for senior management to know what you and your colleagues are thinking throughout the organisation. In December we invited you to complete a survey so that you could discuss your work experience and about half of the staff participated. Thank you for your time, effort and candid comments. When we read the results, it is apparent that you had much to say on a variety of different important topics, providing valuable insight into our Company’s strengths and where we need to improve. Discretionary effort. Employees are putting in the effort to go the extra mile. Brand. Employees are proud of our brand. Work/life balance. The Company provides programs and supports approaches that help employees maintain a healthy balance. Employee voice. The Company encourages employees to share their points of view. Manager excellence. Those who have a responsibility to manage people are doing their job well. We take your suggestions and counsel very seriously. We know from past experience that it will make our Company a more productive and satisfying place to work. For example, in the 2007 survey, we learned that we needed to focus on the quality of our managers. Consequently, we designed and rolled out the Manager Excellence program and introduced new tools through Times Talent. Based on the recent survey findings, it is apparent that this effort is showing positive results. You will shortly hear about your business unit results from your unit leader or manager. Thanks again for your participation; we know how busy you have been. With that said, we count on your active participation in these efforts. These surveys have proven time-and-time again to be one of the best ways to identify opportunities important to your career and the Company’s continued success.